Magic Trixie is a treat for 3rd and 4th graders who love playful stories, graphic novels and fun characters. The graphic novel section is the most popular section at our library, and so I'm always seeking out new titles. I was delighted to find this series, with its vibrant colors and fun stories, and it's been a hit with kids so far. Magic Trixie is a little witch who has growing pains just like all kids. At home, she's frustrated that she can't do anything fun, while her baby sister gets away with everything. And then at school, all her friends seem to have the coolest tricks to share. So when her teacher tells them it's share and tell day, Magic Trixie knows she has to find a really special trick to impress all her friends. Magic Trixie is bursting with color, action and emotion. The illustrations are bright and energetic, full of details that make you laugh. The text is simple enough to be read independently by a 3rd grader, so it will appeal to kids who have moved beyond the Babymouse books. Best of all, while the stories are definitely full of magic and fantasy, they're grounded in kids' every day experiences: friendships, family life, and struggles all kids go through. Take a look at the book on HarperCollin's website. You can see the first 20 pages and get a real feel for the book. 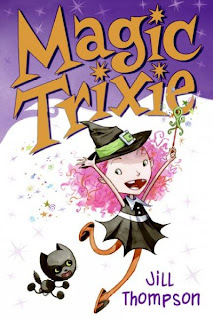 Jill Thompson has written two other books featuring Magic Trixie and her friends: Magic Trixie Sleeps Over and Magic Trixie and the Dragon . She is an established comic book illustrator and writer, and I'm so happy she's writing for this age group. Her Scary Godmother comics have just been collected into a hardcover book that will be great for libraries! The review copies came from my local public libraries. If you make a purchase using the Amazon links on this page, a small portion goes to Great Kid Books (at no cost to you). Thank you for your support! Many kids these days dream of being rock musicians, and yet I wonder what the childhood of many famous rock musicians was like. Are they born with a true gift, or did they practice and practice their music? I do know that some children are drawn to music from an early age - it resonates with them, fills them. If your child is drawn to rock music, they will be fascinated by the new book Jimi: Sounds Like a Rainbow , written by Gary Golio and illustrated by Javaka Steptoe. It is absolutely worth seeking out. Jimi Hendrix was a child who soaked in the world around him, noticing sounds of the rain, the rushing water, truck engines and siren wailing. "With every sound, a color glowed in Jimmy's mind. Blue was the whoosh of cool water, splashing over rocks. Orange and red, the crackling of a campfire. Green, the rustle of a thousand leaves... He wondered: Could a person use music like chalks and colored pencils? Could someone paint pictures with sound?" These questions will resonate with students, speak to their hearts and make them think about how they see and hear the world around them. Javaka Steptoe's artwork is full of color, as he uses mixed-media collage to show the impression of Jimi's childhood world. He steeped himself in Jimi's world and neighborhood, painting on plywood from a store in a Seattle neighborhood. As Steptoe writes in the illustrator's note, "I thought about the depth and texture of his (Hendrix's) music, so I layered and used bright colors: red, orange, yellow, green, blue, purple - rainbow colors." I was a voracious reader as a kid—but rarely of anything that would be considered literary or classic. For me, the long-awaited ritual each month consisted of pulling a dollar from my miniature “safe” (a toy bank), and walking down to the center of my suburban 60’ s town on a lovely spring, fall, summer, or even winter day. Once I reached my destination—the nondescript delicatessen-stationery store that smelled of roast coffee seasoned with the aromas of frying bacon and newsprint—I ambled over to the wall display of magazines and felt like I had entered Paradise. There, calling out to me in their crisp, colorful covers, were the only reading materials I needed to fire up my imagination, inspire moral rectitude, and keep me out of trouble—the newest editions of DC and Marvel comics. What a treasure those books were (and yes, I consider those Silver Age comics to be books, or at least the abbreviated graphic novels of their time). There was: Iron Man—to spark ideas for new electronic gadgets that I’ d invent in my home workshop for deterring would-be crooks; SpiderMan—to console my tortured pre-adolescent psyche that Peter Parker actually had a worse social life than I; Superman—to inspire visions of the Earth and other planets seen from outer space, for voyage there one day; and Dr. Strange—Master of the Mystic Arts, who humbly saved the human race and all manner of sentient beings from unimagined threats and evils, without our knowledge or gratitude. These were my heroes, and they existed between the pages of comic books. In addition—and people laugh when I first say this—comic books were overflowing with fantastic vocabulary words: invulnerable (from Superman); gossamer (from Dr. Strange); transistorized, from Iron Man; and rhetorical from SpiderMan, to name just a few. In fact, I credit my love of new and unusual words to these stories, whose characters often spoke with an archaic diction: “ This bastion of evil and its inhabitants shall see horrific ruination at my hand!” (Thor, Prince of Asgard). Most of all, though, comic books instilled in me the joy and purposefulness of reading—to look outside of oneself, and to learn from other men and women (even if they were make believe) how to survive this sometimes wild ride that we call Life. Thank you, Gary, for a wonderful essay about the power of reading and the way all types of reading can speak to us - just like all types of music can speak to us. You won't be surprised that comic books and graphic novels are the most popular books in our library today! They still grab kids and fill their imaginations. There's also a great interview on NPR's Weekend Edition from last weekend - I really enjoyed hearing Gary Golio and Javaka Steptoe, along with some of Hendrix's music. The review copy was kindly sent by the publishers. If you make any purchases using the Amazon links on this site, a small portion will go to Great Kid Books (at no cost to you). Thank you for your support. I'm always looking out for books that bring in mythology or settings from other cultures, but that are exciting and fun to read. The Percy Jackson series grabs kids because it's exciting and fun, but it fascinates them because it introduces them to a whole world of Greek mythology. Takeshita Demons is an exciting adventure story that introduces children to Japanese spirits and demons. This exciting adventure features Japanese supernatural demons – yokai – and a young girl’s fight to protect her younger brother. Yokai are well known in Japan and still an important part of Japanese folklore, but they are little known outside of Japan. Twelve-year-old Miku Takeshita has recently moved to London, but she misses her grandmother terribly. In Japan, her grandmother taught her about the secrets of the spirit world, including Zashiko, the child-ghost who protected them from hostile spirits and demons. But Miku’s grandmother has died and it is up to Miku to remember these traditions and secrets. Every day, Miku tries to remember to check that the cedar leave is still placed above the door to protect her family from evil spirits. But her mother thinks this is all nonsense. One winter day, Miku arrives at school to find that they have a substitute teacher who turns out to be an evil, child-eating nukekubi demon. That night, strange events start happening and Miku’s little brother disappears while she is watching over him. A breathless adventure follows, with Miku and her friend Cait battling the nukekubi, with her flying head and supernatural powers. This is a fast-paced story that will appeal to readers who are looking for a scary story with a Japanese Manga twist. It is smaller in scale than the Percy Jackson series; Takeshita Demons is just under 150 pages long, while Rick Riordan's novels regularly weigh in at 400 pages plus. I think this is a huge advantage for many readers. I would gladly hand this to a 4th grader, or perhaps even a 3rd grader who likes action and is okay with some scary confrontations.A little brother is kidnapped and threatened by the demon, but no harm comes to him. Takeshita Demons was original published in the UK, and won the inaugural The Frances Lincoln Diverse Voices Childrens Book Award for diversity in children's fiction, for a middle grade novel by a previously unpublished author. Author Cristy Burnes spent many years in Japan and became fascinated with folklore about the yokai, Japanese spirits and demons. For another review, check out the always-excellent Paper Tigers. "Cristy Burne has created a fast-paced story full of suspense that is further intensified by Miku's matter-of-fact narration. Cait’s incredulity at Miku’s initial explanations, and then her own involvement in subsequent events allow Western readers to be pulled into the Japanese spirit world that Miku so takes for granted." The review copy was kindly sent by the publisher. If you make a purchase on Amazon using the links on this page, a small portion will go to Great Kid Books (at no cost to you). Thank you for your support! Just a quick note - if you live in the Bay Area, there are some fabulous author events coming up. 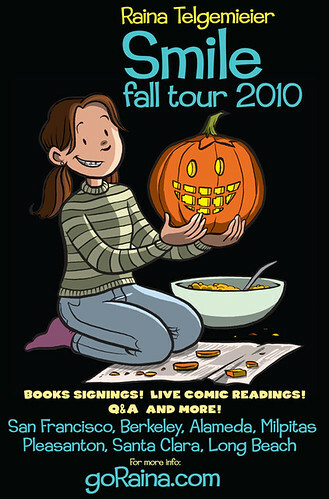 Lisa Brown has several events for her new book: Vampire Boy's Good Night . I love this sweet Halloween tale, perfect for young kids (ages 2 - 5). This is a great neighborhood bookstore in the Montclair neighborhood of Oakland. Join us for a Halloween party and a Bloody Benefit! Please come in costume! Storytelling, mask-making and yummy snacks! With benefit to The Blood Centers of the Pacific. This was one of our family's favorite books this year, and one of the most popular books at the school library. It is a graphic novel that tells the story of how Raina lost her two front teeth from a simple accident, and her journey to restore her smile and navigate life through middle school. Come hang out with Raina and a bunch of the creators in the museum’s STORYTIME! exhibit, where you can see a bunch of original pages from Smile on display! Suzanne Collins , the author of the bestselling teen trilogy: The Hunger Games , will be visiting the Bay Area in November at Kepler's Books in Menlo Park and Hicklebee's in San Jose. This is sure to be a packed event. Call the stores for details to see if you need advanced tickets. For more tour locations for Suzanne Collins, sehttp://www.scholastic.com/thehungergames/about-the-author.htme the Scholastic Site. Jane Wattenberg (aka Mrs. Mustard) will talk about Edward Lear and her vibrant take on Lear's creative poem The Duck and the Kangaroo , with her real live Duck, Edward. The event is at Temple Israel in Alameda, for their Book and Cookie event. Edward will wear a tiny hand-crocheted, duck-size yarmulke for the occasion. Come join us. Have fun! It's great to share the excitement with your children, and realize that their favorite books are written by people just like them. My students clamor for really scary stories, especially at this time of the year. They love, love, love Alvin Schwartz's Scary Stories to Tell in the Dark . 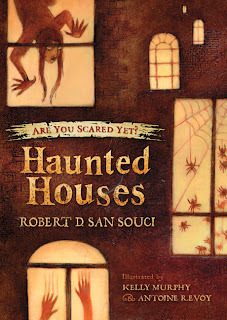 If your kids like those creepy stories, but are ready for longer short stories, check out Robert San Souci's Haunted Houses - it definitely got under my skin. It isn’t often that I recommend a book that I haven’t read in its entirety, but I am – I admit it – a scaredy cat! You see, I started this collection, but I just couldn't finish it. And now, I can’t stop thinking about San Souci's creepy stories. You’ll find ten tales of haunted houses in this collection by Robert San Souci, one of San Francisco’s great storytellers and folklore collectors. In one story, a boy’s family is vacationing in a house that is taken over by spiders. Now, these aren’t your typical garden spiders. They are spiders who want revenge for the damages done to their forest and homes. Danny starts to get worried when he finds the rabbit cage filled with spider webs, and then realizes that the bundles in the corner are the dead rabbits encased in spider webs. The story proceeds to even creepier, as Danny discovers more ways the spiders have wrecked damage on previous owners of the house. Needless to say, every time I walk into a spider’s web now, I jump even higher. These stories are not for the faint-hearted or those prone to nightmares, but for kids looking for spine-tingling tales, this is your perfect find. Robert D. San Souci is the award-winning author of the Short & Shivery series of tales, as well as many picture books based on folktales from around the world. He is also the author of Dare to Be Scared , named a Children's Choice for 2004 by the Children's Book Council. The review copy came from my local bookstore, Mrs. Dalloway's, in Berkeley. They have a wonderful selection of children's books, and staff who can really help you find the right book for your child. Please note, if you make a purchase using the Amazon links on this page, a small portion will go to Great Kid Books (at no cost to you). Thank you for your support.